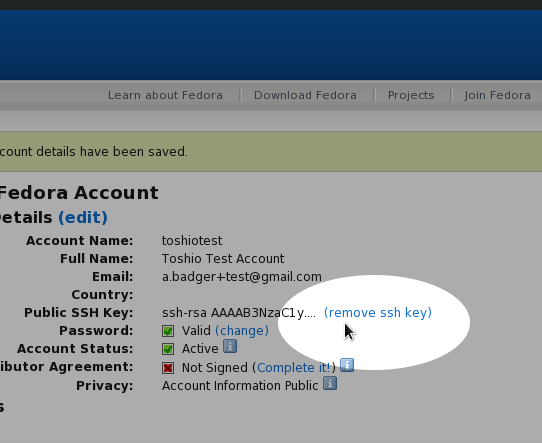 The past few weeks I’ve been coordinating a new release of the Fedora Account System(FAS). Since FAS is something used within Fedora but not a whole lot of other places, development is usually driven by a relatively small handful of people: Ricky Zhou, Mike Mcgrath, and I. This release saw a large number of other contributors which has been very good as the three of us have been increasingly pulled into other projects so our time for FAS has steadily decreased. Jim Lieb contributed code to make handling of languages easier and made FAS more configurable for use in other sites. and for the first time in several releases we coordinated our release with the Fedora Translation Team on transifex so that the translations they contributed could go out with the first release instead of when a subsequent bugfix was released. So let’s take a brief tour of some of these new features. There have always been many times more accounts in FAS than there were active contributors to Fedora. In itself, this wasn’t a problem. However, at some point, spammers started signing their bots up for Fedora accounts as they found that with that, they could write to the Fedora Wiki. 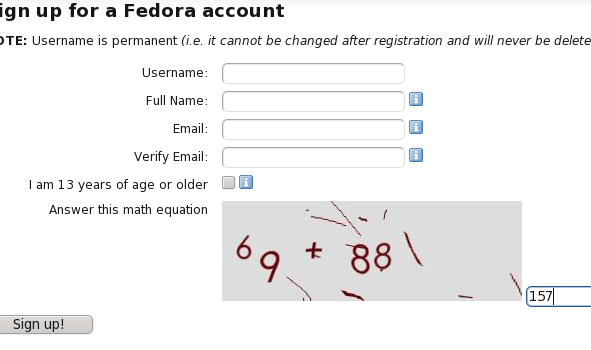 To combat this, we added a captcha to the signup process. However, we quickly found that the captcha we added was too hard. Many people came to us to complain that they could not answer the captcha successfully. Thanks to pingou, we have a new captcha which displays a simple math equation in a much less distorted image. Writing the correct answer to the equation is all you need to do. These are just some of the more user visible changes. If you’re interested in the more behind the scenes changes (SELinux fixes from ricky, password strength checking, and more), check out the changes in FAS’s git repository.